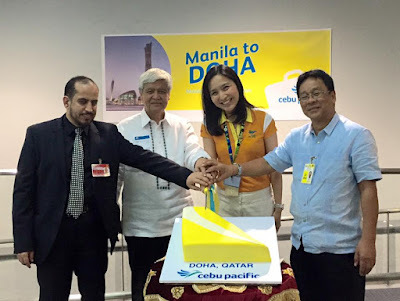 Aviation Updates Philippines - Cebu Pacific Air has launched twice-weekly flights to Doha, Qatar on June 4, 2015. The launch of the Manila-Doha service makes the airline the first Philippine carrier to operate the route between the two populous cities. Launch of Manila to Doha flights featuring a cake formed with Cebu Pacific's new tail design. Cebu Pacific's newest flights will operate every Monday and Thursday departing the Ninoy Aquino International Airport at 9:35 PM and arrives at Doha's Hamad International Airport at 2:45 AM the next day. The return flight, 5J 7835, departs Doha at 4:15 AM and arrives back in Manila at 6:35 PM. "We look forward to offering Cebu Pacific's trademark low fares to travelers in Doha, especially since we are the only low-cost carrier operating this route. With our expanding network, Qatar becomes more accessible from the Philippines, and the Filipino community can reunite with their families more often," Cebu Pacific General Manager for Long-Haul Division, Alex Reyes said. The airline operates its Airbus A330-300 aircraft - which is capable of carrying 436 passengers - on the Manila-Doha flights. Hot meals, seats with extra legroom and Wi-Fi onboard, and more are available as add-ons on-board the Airbus A330 aircraft. "Cebu Pacific's presence in Qatar will not only benefit the more than 200,000 Filipinos, but also both Qataris and the country's flourishing expat population who will now be more enticed to visit the Philippines with its affordable rates. We are hoping to tap Cebu Pacific as the Embassy's partner in promoting the Philippine tourism in Qatar," the Philippine Ambassador to Qatar, Wilfredo C. Santos said during the launch. "Hamad International Airport is pleased to have added one more airline to its operations and we would like to take this opportunity to congratulate Cebu Pacific Air on its growth and success," said Badr Mohammed Al Meer, Chief Operating Officer at Hamad International Airport. "As the gateway into Qatar and to the rest of the world, we are glad to have the opportunity to facilitate easy and convenient passage to the Philippines," he added. Qatar has the third largest Filipino community in the Middle East with over 260,000 Filipinos living in Doha. Besides Doha, Cebu Pacific operates flights from its main hub, Manila, to Riyadh, Dubai, and Kuwait utilizing its Airbus A330-300 aircraft. 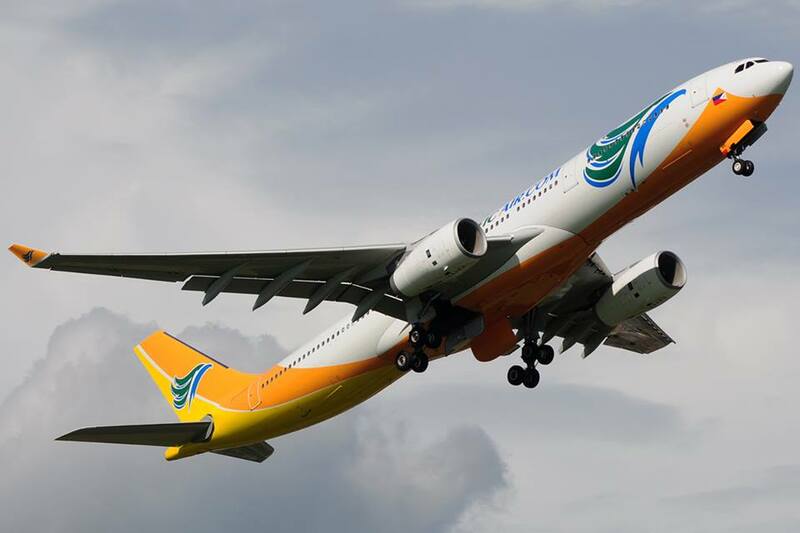 Cebu Pacific's 55-strong fleet is comprised of 10 Airbus A319, 31 Airbus A320, 6 Airbus A330 and 8 ATR-72 500 aircraft. It is one of the most modern aircraft fleets in the world. Between 2015 and 2021, Cebu Pacific will take delivery of 7 more brand-new Airbus A320 and 30 Airbus A321neo aircraft.